Disgraced British presenter receives invitation to Moscow to discuss details. Russian TV channel Zvezda has offered disgraced British presenter Jeremy Clarkson his own television program, less than 24 hours after the BBC confirmed that Clarkson had been fired from the cult car show Top Gear. The details of the proposal were revealed on March 26 on the official website of the channel, whose programming is overseen by the defense ministry and focuses on military topics. Clarkson was invited “to visit Moscow at the beginning of April” to discuss the details of the offer. The company has already received an answer. “I can only imagine an episode of Russian высшая передача [Top Gear – RBTH] would look like! It could feature a Tzar in a reasonably priced car!” replied Rix. According to Timofei Peshkov, the deputy of the head of the Zvezda PR department, there has also been a phone call with Rix, in which he promised to examine the offer. He denies claims by some Russian internet sources that the channel’s initiative is related to an idea by Vitaly Milonov, Russian deputy of St Petersburg Legislative Assembly. On March 21 Milonov, notorious for his extravagant statements and controversial initiatives, said that Clarkson could find a merited job in Russia, declaring his readiness to discuss the matter with various TV channels on Clarkson’s behalf, reported Interfax. “Of course we can’t pay as much as the BBC paid him but there are other resources,” said Peshkov in answer to a question from RBTH as to why Clarkson would consider abandoning British TV for Russia. Rix has so far not responded to requests for comment from RBTH but Zvezda confirmed that so far there has been no any other reaction from him or Clarkson personally. 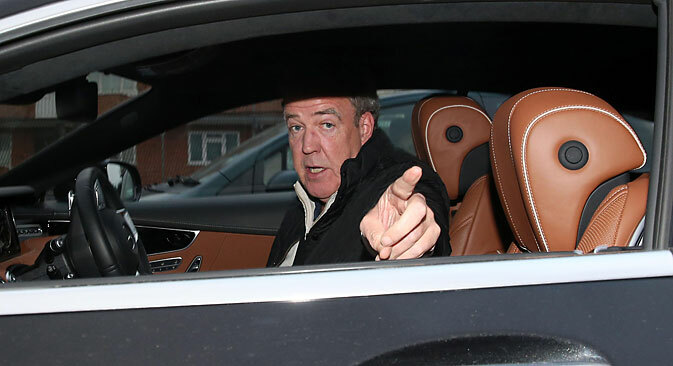 As was reported earlier by Western media, the BBC suspended Clarkson from Top Gear after he punched the program’s producer Oisin Tymon during filming on March 11. The corporation subsequently decided not to renew Clarkson’s contract, which expires at the end of March 2015. The Russian Armed Forces Broadcasting Company Zvezda was founded in Feb. 2005 on the initiative of the Russian Ministry of Defense. In its broadcasting it focuses on military and historical topics. One of the most popular auto shows in Russia, Top Gear airs on the state television channel Rossiya 2. Before this it was broadcast on the channels NTV and REN-TV. It has been broadcast on Russian television since 2004.